Those of you who read here often and/or follow me over on Instagram are likely familiar with how much we love Freshly Picked. They're good folks. They featured our birth story on their blog earlier this summer, we teamed up with them for a giveaway last month, and Essley has worn their shoes in a couple of outfit posts with me over the course of the year. They're down to earth, kind, hardworking, and motivated by a positive mission. And their founder and owner, Susan, is a righteous babe. She started the business in 2009 with $200 and her own bare hands, and has grown it into a well-known, incredibly successful company that has been featured on television and in all sorts of magazines - with a product that is worn by thousands and thousands of kids and babies worldwide (including some pretty famous ones). Oh, and despite the growth, each pair continues to be made by hand here in the U.S. Pretty great. Today, I'm going to share with you a little about why we like them - along with some of my favorite pictures of Essley rocking them. Although I'll do the occasional review around here, I like to keep them pretty limited. That said, if there is a particular product that I genuinely adore, especially if it's made by a company who I feel good supporting, then I like to spread the word. This is one of those products. I didn't get paid to write this post. We just really dig these guys, and their shoes too. Essley's first pair of Freshly Picked moccasins (Swimmin' With the Sharks) arrived while I was still pregnant, from a giveaway that I'd been lucky to win. I'd had my eye on their shoes for her for quite some time, thanks to their adorably stylish design. I was even more impressed once I'd received them and was able to see the quality in person. As soon as Essley was big enough, she started wearing them on a regular basis. A few months later, FP generously sent another pair for her to wear (this time we opted for the Goldenrod). Once again, the quality was consistent, and they were even more beautiful in person. Essley tends to kick shoes off almost immediately, but she doesn't do this with her FPs. I'm guessing it's because they're comfortable for her - the leather is soft and molds to her little feet (which allows for better foot development), instead of feeling stiff or too structured like most baby shoes. In fact, they stay her on feet through pretty much anything. And at almost 8 months, she is constantly rolling and scooting and beginning to crawl, moving her feet all over the place. The design of FP's moccs is somewhat genius, really. Each shoe features a hidden piece of elastic that allows for the shoes to go on (and be taken off) easily, yet still fit snugly to the child's foot while on. We like this. A lot. As a new mama, it's nice to discover certain baby products (wearable items included) about which you can feel confident in terms of quality, consistency, and aesthetics. I like being able to know that as Essley continues to grow, and begins to walk and become even more mobile (yikes! ), I can count on Freshly Picked for her everyday shoes. It's almost time to go up a size, and I'm trying to decide which color to get next. I should add that they've also recently added some seriously gorgeous carryall bags to the mix (hello, Christmas list!). 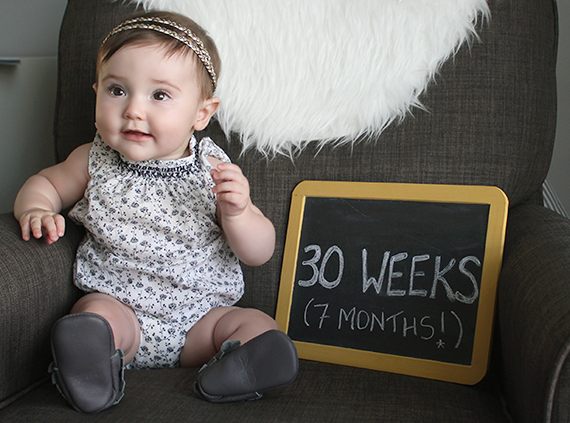 Thanks for letting me share a little about my favorite baby shoe brand with you guys. If you're looking for a new pair of kicks for your little one, or a genuinely great gift for a niece, nephew, grandkid, or friend's child, I truly can't recommend Freshly Picked highly enough. You can find out more about them (and browse all of their delicious colors) on their website. You can also find them on Instagram, Twitter, and Facebook. Moccasins c/o Freshly Picked. 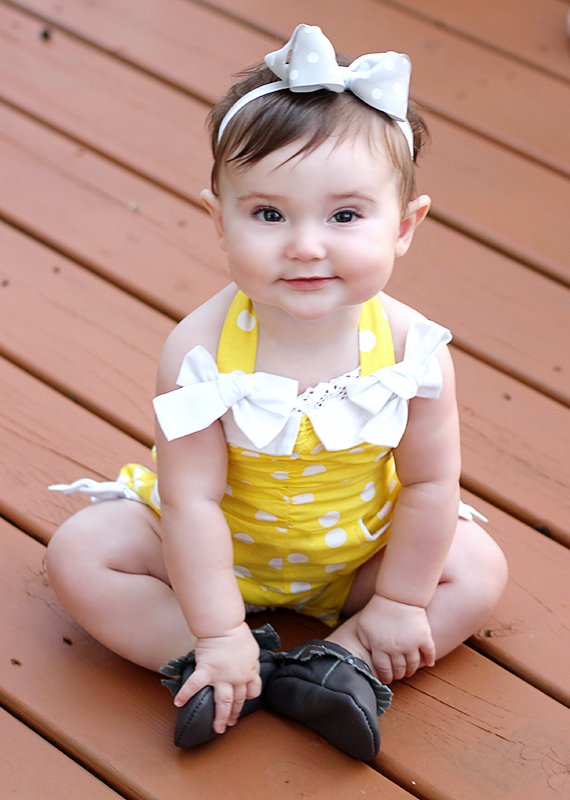 Yellow romper c/o Runaway Pony. Orange and white headband c/o The Line. 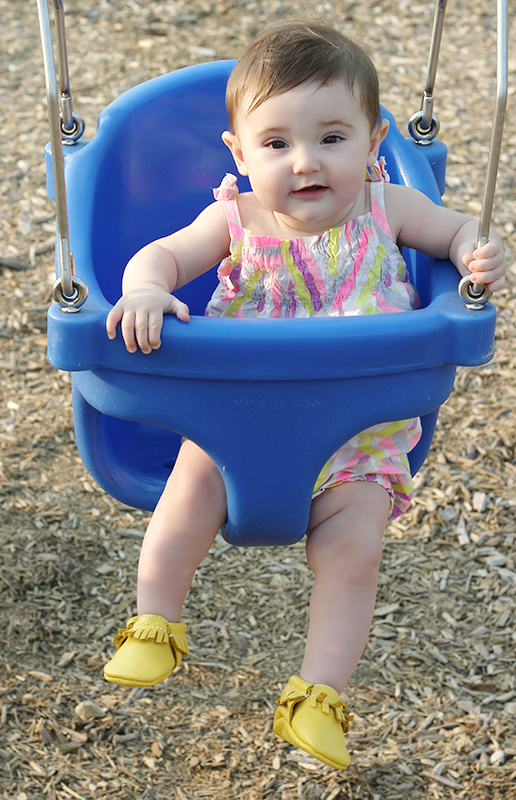 Those shoes are too cute and Essley looks so adorable in them! Freshly Picked are such great people making such cute and quality things! I love baby moccs!!! Freshly Picked offers great colors too. Unfortunately, I hadn't heard of the brand when my baby was a baby. =( My baby girl had MiniMocs from Etsy. I recommend these types of soft-sole shoe for all small babies, because they're perfect for their little growing feet, and they're just so dang cute. I've entered to win some Freshly Picked Moccs in a couple of giveaways. Fingers crossed! Adorable! I love Freshly Picked shoes. I don't have any kids yet but I always see them on cute blog kids. They are the cutest. I just bought a pair of these for my niece last week! Can't wait to get them! Your daughter is so cute. Thanks for your comments you guys! They really are the cutest shoes ever. Those shoes look very fashionable and comfortable. And I like your black and white dress!